HomeCinemaMasalaHere is how Deepika Padukone is making up for her absence in the city this Holi! Here is how Deepika Padukone is making up for her absence in the city this Holi! Holi is around the corner, and everyone is gearing up for a fun-filled time. Among them is Deepika Padukone, who will not be celebrating the festival of colours in the city as she is away in US filming for her Hollywood film. Even though Deepika is not in town, there are hoardings of the actress immersed in colours plastered all across the city. The large hoardings are a part of a haircare product that Deepika endorses. The omnipresence of Deepika across the city sure does make up for her physical absence during the festive season. Who better than the Balam Pichkari girl to tell us how to enjoy Holi to the fullest! 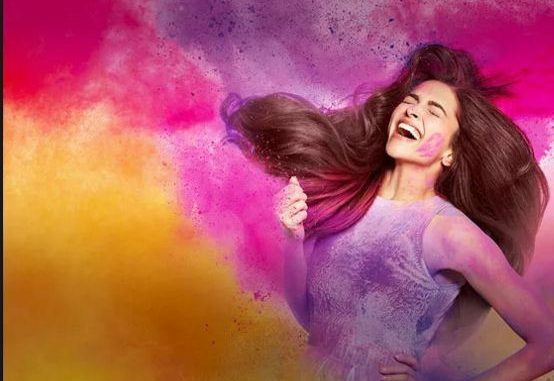 Deepika’s hoardings across town sure to bring out the festive season at its best with the actress encouraging on and all to let go and enjoy the festival of colours! Lotto Max: I didn’t win… again! Maybe the 6/49?